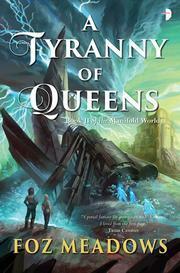 A Tyranny of Queens is the second in Foz Meadow’s “Manifold Worlds” series. I took a look at its predecessor, “An Accident of Stars” last year, and was quite impressed with its particular blend of portal fantasy. I’ve been looking forward to seeing where the story goes on this one. The story begins back in what we think of as our world. Saffron, one of the protagonists of the previous volume, has found herself back home after her otherworldy jaunts. Unfortunately, she’s also found herself scarred, emotionally and physically, and reticent to explain exactly how these changes came about. Facing a social worker and a concerned family, she goes back to school. There’s a slow tension building up, permeating the school – at least there is for Saffron. She seems out of her element, struggling to adapt to the petty daily realities. The structured lessons, the ambivalent authorities and the skin-crawling social environment are all carefully constructed, and carry an immediacy and an honesty which make them feel genuine, if not pleasant to read about. There are, though, other worlds than these – and their vibrant colour and energy stands in sharp contrast to the institutional drudgery to which Saffron has initially resigned herself. We’re also visiting the world of Kenans and the Veksh, cultures firmly established in the previous book. The story takes a hard, unflinching look at borders and history. It’s interested in exploring the divergent cultures available in this alternate world, and starts laying out a little more of the history that has led to the current state of affairs. This exploration of how and why peoples have settled into their current cultural structures is absolutely fascinating. It’s also done cleanly, a gradual process of reader discovery matching others in the narrative, rather than a massive infodump, which was very much appreciated. If the world was a mystery before, it may become less of one over the course of the text. I appreciated the opportunity to share in the excitement and worry of discovery, and thought this was particularly well done. This also feels like a more political text than its predecessor. There are intrigues aplenty, and more than a few moments where characters are trying to work out what they can say, and who they can trust. In a world which allows for the sharing of skills and memories, issues of trust are paramount – and exploring the erosion of that trust, or its restoration, is another facet of the narrative. It’s well done, and there were more than a few moments where I was more than startled. This is an example I think of the way that the world building has clearly been done with great care. Each of the cultures presented has their own mores and expectations, and they still clash gently (or less than gently) from time to time. But everything is internally consistent within a culture, which means that although we may not get all the details, we can see enough of them to make each nation, with its different ethics and values, feel alive. Admittedly, it still feels like there’s too many linguistic terms and cultural titles thrown around, but I got used to it after a while, and the prose flows along quickly enough that I didn’t stumble over the terminology too badly. The characters, now. I always rather liked Saffron, the quietly desperate protagonist from earth. After her experiences in the first book, she’s back, albeit somewhat feistier. This is by no means a bad thing. Watching Saffron get a firmer handle on who she is, what she wants, and how she’s going to achieve it is fantastic. There’s still doubt there, and a certain frailty, which helps keep her human – but her burgeoning confidence, and growing refusal to take ownership of other people’s crap helps make her a heroine it’s a pleasure to turn the pages with. She’s ably assisted by the supporting cast of Kenans and Vekshi of course. A surrogate family of sorts, they’ve got an unforced enthusiasm for life, and an energy which makes them charming company. There’s enough arguments, discussions and human frailties in there as well that they feel like people, rather than constructs – and their support for Saffron and each other is unforced and a rather lovely read. The villains though – the villains are where this shines. I won’t add spoilers here, but it’s great to see Kadeja again. She was the focused, driven, self-justifying and generally appalling antagonist of the last book, and her rather vile dynamism is guaranteed to make her steal a scene if she’s in it, one way or another. In contrast to Kadeja’s iron certitude, the conflicted Leodan is somewhat more mysterious – a man who stole a throne, paying a long game, a man wearing more than one face – he’s something of a cypher; the longer he was on the page however, the more intriguing he became. Kadeja owns a room when she walks into it; Leodan appears more sympathetic, more personable – despite his actions in the previous text. They’re both, if not charming, certainly compelling – I found it difficult to put the book down, trying to discover what scheme they’d started rolling at the conclusion of the previous book. Speaking of which: I won’t spoil the plot, but this is a book that promises answers. There’s more than a few of those scattered through the pages, alongside red herrings, betrayals, and the occasional murder. At the end of the day though, this is a story which embraces the sense of discovery, and of looking for the best in humanity. I mean, there’s magic, and more than a few revelations which made me stop for a moment to recover, and far more that made me stop and think. It’s got well-paced prose, and some truly explosive moments running alongside a fascinating discussion of humanity, and the decisions that people make – a wider story, wrapped around the journey of Saffron and her friends and family. Is it any good? Well, I rather enjoyed it. I’d say you can just about read this without the first volume, but I’d suggest starting there. The context provided is invaluable. If you’re coming to this after reading the first book – then this is a worthy successor, a clever and innovative piece.